More than 30 expectant mothers seeking family planning and antenatal services at Anyeke Health Centre IV in Oyam District were on Monday left stranded as there were no nurses to attend to them. Ms Rose Ogwang, who had travelled from Lira District, which is about 40 kilometers away, said the hospital had only two nurses attending to the many patients in the maternity ward. “Since I came here, I have seen only two nurses working in this maternity ward. At the moment, there are two mothers coming to deliver and yet they must also attend to us who have complicated cases,” Ms Ogwang said. Ms Sarah Awidi, a nursing assistant, said most of her colleagues were promoted and could not remain at the facility. “This means poor quality services will be given to our mothers because you find the same nurse giving family planning services to the mothers is same nurse giving the treatment in the ward,” Ms Awidi added. Dr Vincent Owiny, the district health officer, said the district lost a number of midwives in the recent countrywide recruitment because they were promoted. 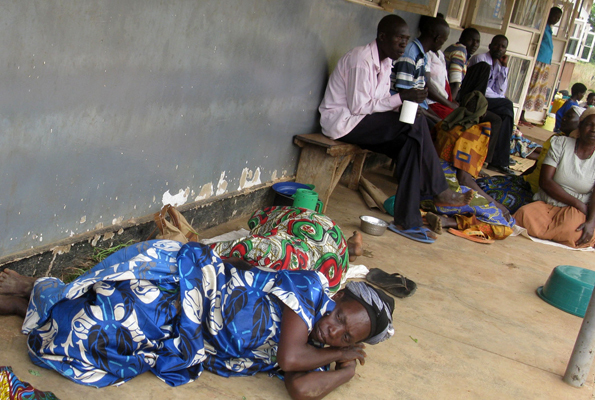 Uganda, like many developing countries, is experiencing a human resources crisis in the health sector. According to the 2010/11-2014/15 health sector strategic plan 111, the current number of health staff (Doctors, nurses, midwifes) in the country, totals to 59,000, with a ratio of 1: 1,818 people. This is far below the recommended WHO minimum standard, which considers countries with less than 1 doctor, nurses or midwife per 439 people, in critical shortage of health workers.